Flowers were BEYOND Beautiful!!!!!! And very Reasonable! Mrs. Weavers flowers were SO BEAUTIFUL!!!!!! She is located in the amish community in St. Marys County of Southern MD. I gave her a picture of the idea I had, and she totally brought it to life and then some! I had her make 6 bridesmaids bouquets, my bouquet, loose flowers for cake, 9 boutonnieres, 3 big spreads and 12 long stem roses. Everything was fresh and amazing! I will definitely be recommending her to everyone and even going back for more flowers for my house! Weaver's did excellent work for our flowers. Mrs. Weaver will walk you through what's in season and offer alternatives as needed. You need to provide pictures for her to work from. 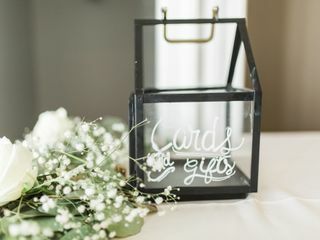 The price was UNBEATABLE - we got 12 centerpieces, 5 corsages, 9 boutonnieres, 4 bridesmaids' bouquets, 1 bridal bouquet and 25 small arrangements for $860. You do have to pick up yourself the morning of, but it's so worth it. I will add that it helps if you're a bit flexible - she grows a lot of the flowers herself, so you have to work with what she has available. BUT, everything is fresh and looks great!! Can't recommend them enough. 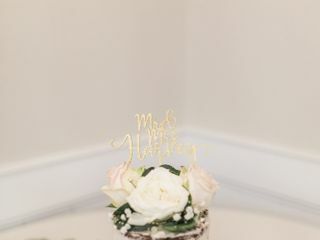 I am so happy we decided to move forward with Weaver's for our wedding day flowers! The centerpieces and bouquets all turned out beautifully and at the fraction of the cost of other florists! You will not regret your decision! You cannot beat the quality and value of Weaver’s fresh cut flowers. I recently used them for my wedding on 9.16.17. The flowers were absolutely gorgeous and I spent a quarter of the price I would have paid at any other florist. This is an Amish florist, so keep in mind that they have no contact by phone or email which can be challenging and they do not deliver. Everything must be done face to face at their home- but the challenges were well worth it for the value and the extreme quality of my wedding day flowers. We could not have been more pleased with our flowers for our wedding from Weavers Fresh Cut Flowers! We got a combination of baby's breath, blush pink roses, and hydrangeas and they were all absolutely gorgeous. So many people said they had never seen any more gorgeous flowers and I would have to agree! The quality and price are unbelievable. We got a bridal bouquet, 7 bridesmaid bouquets, over 40 bunches of baby's breath, 40 single stem roses, two boutineers, 4 corsages, a set of cake flowers, two larger floral arrangements to set atop of wine barrels, and 3 sets of larger bunches of flowers for $850. The flowers held up so well even days after the wedding. Working with Roda was fabulous. We took her pictures (from Pinterest) for inspiration and she absolutely captured the look we were looking for! As many others have mentioned, you have to go to their workshop to communicate with them, but for the price, it is totally worth it. You will not be disappointed with the Weavers! BEAUTIFUL FLOWERS! Absolutely what I wanted. I came with some big printed pictures of flowers and she took the inspiration and made it work for the season and our containers. The prices were amazing, she was super helpful and I would absolutely recommend her to others. I wish I lived closer so I could get flowers for my house from her every week. We didn't do much, just the wedding party bouquets and boutineers but they were so perfect. Nice big, full, colorful roses. Mrs. Weaver was so sweet and so helpful! And you can't beat their pricing anywhere! Let me just start by saying I was thoroughly AMAZED! I had been nervous after our first visit with Mrs. Weaver, only because I could not find any pictures of her work, nor did she have an album of pictures of her work. Let me tell ya, the day of the wedding I was SO EXCITED to finally see these bouquets come to life! They were perfect; actually they were better than I had imagined them to be. 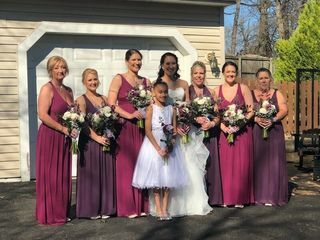 I originally took her ONE picture of what I kind of wanted with a few notes written on it, never took her a color swatch of my bridesmaid dresses and the bouquets ended up being the most gorgeous flowers I've ever seen and matched the dresses PERFECTLY. Her prices can't be beat either! 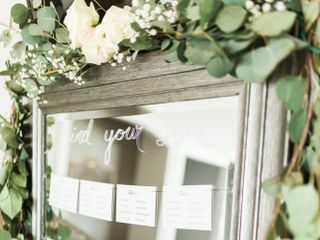 Just a heads up for all you future lookers into her work, you need to supply the ribbon for bouquets (if needed), and vases you want used if its for centerpiece's or flowers for an altar. Other than that, you don't need to do anything but sit back and wait to be amazed by your flower arrangements. I HIGHLY RECCOMMEND! Absolutely love the flowers that we received for our wedding. Even more beautiful than ever expected. Great service and super wonderful family! Highly recommend! Absolutely Amazing!!! Super Cheap! Beautiful! I just took a few pictures with me of the kind of style I wanted and they turned out better then I could have imaged! I got so many flowers for less then $700! Believe the hype! Weavers provided beautiful flowers for our wedding at an amazingly low price. Because they ended up being overbooked for our wedding weekend, they provided arrangements for my bridal bouquet and 4 bridesmaids bouquets, and designed corsages. The rest of the flowers were loose flowers that we had to arrange ourselves. They told us this when we first met with them so we were prepared. It was definitely worth it! The flowers were amazing and we paid like 1/4th what we would have for another florist. Weavers did an amazing job on my wedding flowers. You can't call or email them since they are amish but the whole process was seamless and the flowers were amazing. I showed her a couple pictures, she gave me some suggestions and she handled the rest. They were even more beautiful than I could have imagined. I can not tell you enough, GET YOUR FLOWERS FROM MRS. WEAVER!!! They are so, so SO affordable and there is nothing, NOTHING lost in value! The only thing to be aware of is you will not get the same sit down experience as you would with a florist in a fancy shop with books of what to look at. They're Amish, so no phone, e-mail, or delivery. I would either be a) not too picky or b) know what you want but be flexible. I knew the types of flowers and colors I wanted, showed up to the house with my mom and she gave me pricing. I paid in full a couple of weeks before the wedding when I dropped off my containers. I sent two groomsmen and just had them double check against my list that they were given everything I asked for. The flowers were so, so beautiful. All my girls kept their bouquets and dried them out. I couldn't have been happier with them! Mr. and Mrs. Weaver were very nice and accommodating throughout our process. We took printed pictures of examples we liked and explained the types of flowers we were looking for, colors, etc. We were honestly surprised that they had availability as we went about 6 weeks beforehand and they said they could still do it. We were a little nervous because you have to go to them and show them everything in person, but we delivered all the containers, they filled them pretty much exactly like the pictures we provided, and packaged them really well (this was what I was most worried about for transporting them ourselves). In total we got 13 centerpieces, a lantern with flowers cascading out, 2 medium vases, 4 small vases, 2 7 foot garlands for fireplace mantles, filled a teapot with flowers, a bridal bouquet, 4 bridesmaid bouquets, 7 boutonnieres, and 6 corsages for about 70% less than a quote we originally received from an actual flower shop, and we even added a few things to the order that we didn't ask our original florist. Overall, highly recommend and I will certainly do future shopping with them as you can go and just got a bouquet for a vase for your house with any available flowers they have. Note: We did ask them about hours and they stated they are closed Sundays, but are there Monday-Saturdays from early morning until 4 or 5PM (unless they are closed for a specific reason). They are also located on Loveville Road, not Busy Corner Road (which I found an old address originally), and there is a small sign saying Weaver's Fresh Cut Flowers down a long dirt driveway. Amazing! Mrs. Weaver is so sweet and my wedding flowers were beautiful and even more then I thought they'd be. They were so beautiful and perfect! Highly recommend! Loved working with the Weavers. A little extra work on your part but well worth the money. Came in at about half of what I was quoted at another florist. You do have to actually go see them and bring pictures (Amish) and also pick up all the stuff yourself but it's so worth it. They are right on Loveville Road, near the produce auction. We had a great experience with Weavers! My mom and mother in law were the ones who went to meet with them to discuss details, because I did not care about the details, I just wanted white flowers and greenery for our winter wedding. We had friends pick the flowers up the morning of the wedding, which worked out well, but my one suggestion would be to ask the Weavers when you are there what size car you'll need, because we ended up having too much stuff for one car, with 25 centerpieces, multiple bouquets, and the biggest thing were these giant garlands we had made for decoration for the bar area and long tables. 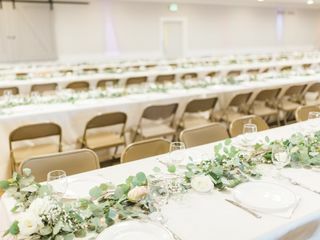 If you are just getting a normal number of centerpieces and bouquets and no garlands a normal small SUV or mini van would probably be fine. We could not have been more happy with Weavers. Our flowers were beautiful and they were so great to work with. Some people might think that having to drive to the farm each time to talk to them and pick up the flowers would be too time consuming, but it was so worth it! They were very easy to work with and extremely accommodating. I wasn't sure exactly what kind of flowers I wanted, I just wanted specific colors and they came up with amazing arrangements. I would highly recommend them and will be using them in the future. I am so happy that I decided to go with the Weavers for my flowers! While I had a hard time arranging an appt. they were out the day I decided to drive over, I was able to make an appt and it went so well. I am not that into flowers, but I knew I wanted a wild flower hand-tied look. I also had specific colors in mind as well. But beyond that I was clueless. Mrs. Weaver was able to magically transform my thoughts into the most beautiful arrangements I have ever seen! When they arrived on the day of our wedding I was blown away. As was everyone else. I kept telling everyone that I was using an Amish family to do my flowers and got skeptical looks. I had fears about using them, as they don't use email or do things they way I do, but in the end I am SO happy I went with them. I didn't want to spend a small fortune on flowers, because they weren't that important to me, but these flowers were beyond my dreams and I felt I got the better end of the deal! I am now drying my bouquet and we shall see how that turns out. I didn't think I'd want to keep them, but after I saw them I did! If you want amazing flowers on a budget, flowers that in my opinion are way better than a stores, go with the Weavers. I spent about $900 for 3 large ceremony arrangements, a bride's bouquet, 4 bridesmaid bouquets, 3 mom bouquets, 10 center pieces and the boxes they sit that her husband made, and extra loose flowers for other vases. It will be unconventional dealing with them with no email or website, but you will not be disappointed! Just take a trip down on a saturday and you should be ok! Just don't go on thursday, I believe that is the normal day they go out! I used Weaver Fresh Cut Flowers for my daughter's wedding. They were absolutely beautiful. We had gotten prices from other florists and I was amazed at the final price. I took pictures of what I wanted and what we got were so much prettier than the pictures. They are very easy to work with and very accommodating. 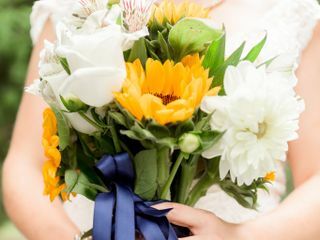 The flowers I had for my wedding were beautiful and on top of that I was able to get them at an amazing price! The Weavers are very friendly and she is great at what she does. Because they are Mennonites (similar to Amish) I knew I should probably bring printed pictures to show her ideas I liked. I left the pictures with her and she was able to create exactly what I wanted. The only downfall which is to be expected is that they do not deliver obviously since they do not drive vehicles so you have to arrange with a friend or family member to pick up your order and take it to your venue. But because of the unbeatable price and beautiful product she provides it is well worth it to use Weavers Fresh Cut Flowers as your florist. 1 Bridal Bouquet, 9 Bridesmaid Bouquets, 6 Centerpieces, 24 Single Stems for Bud Vases & 5 Bouts... the price: $600. Not only was the cost saving absolutely ridiculous, but the flowers were drop dead gorgeous. I can't thank Mrs. Weaver enough. Our flowers were absolutely beautiful and way more affordable than other florists in the area. I asked for orange gerber daisies, and she showed me 4 different shades I could choose from! Our wedding order was simple, but the options are endless. They were super friendly and helped make sure that I had everything I needed. The Weavers provided absolutely stunning hydrangeas for my wedding at an unbeatable price. It's been almost two weeks since our wedding, and the flowers we kept from the reception are still perky and beautiful. Unbelievable! I highly recommend this well-kept southern Maryland secret. 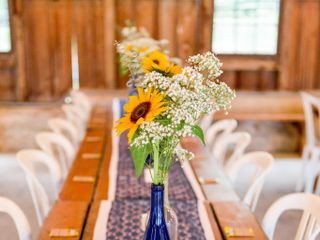 I was a little weary to use weavers as I had no way of contacting them without just showing up at their home but I have to say my flowers were my absolute favorite thing at my wedding. the arrangements truly made our reception one to remember. their prices are unbeatable and mr and mrs weaver were so friendly and easy to work with and there were no surprises when it came to what I asked for and what i received. I continue to use them on other occasions, birthdays, mothers day etc.